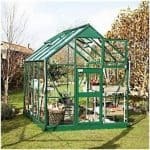 This is a good size green frame greenhouse which is made out of aluminium and has horticultural glass panels. 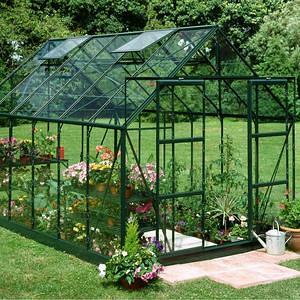 There is plenty of ventilation and temperature control so plants, seedlings, fruit and vegetables will thrive. 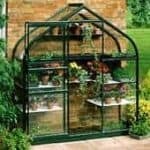 This has wide opening doors and is traditional in styling, ideal for a keen gardener who enjoys working with delicate plants. This product is home delivered. 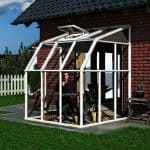 I bought the 10×8 version of this greenhouse and I must say, I am pretty impressed by its service. It is large and spacious and a fair amount of plants can be grown here. 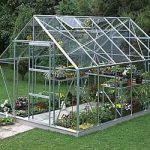 What I love about this greenhouse is its aluminum and horticultural glass panels. The aluminum covering is of great quality and it does not rust. 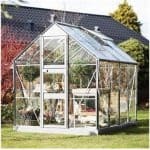 This greenhouse provides adequate amount of ventilation for the proper growth of the plants and is also efficient at temperature controlling. 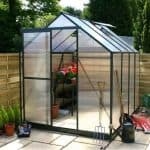 Even though this greenhouse has a high cost, but the service it provides is definitely worth the price.